Why is Digital Weighing more efficient than POS Systems to reduce food waste? Home / Blog / Why is Digital Weighing more efficient than POS Systems to reduce food waste? Environmental pressures and the increase of food and staff costs make preventing food waste more important than ever. Food waste is not only bad for the environment, but it is also extremely expensive. According to the FAO, approximately one-third of all food produced for human is lost or wasted, and the economic cost of this wastage is the equivalent of USD 1 trillion per year. For the hospitality sector, reducing their food waste comes with great economic opportunities. Furthermore, food waste reduction is one of the top 3 trends that both hotels and caterers should follow in 2017 in order to remain competitive in an increasingly pressurised climate. But how can the hospitality industry effectively track and reduce their food waste? 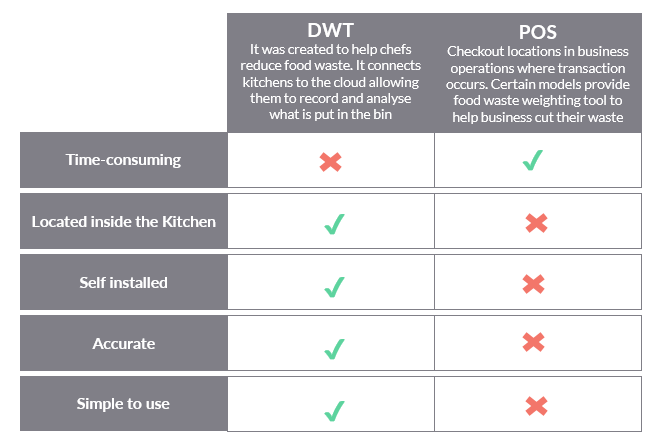 Our experience shows that before choosing to use a Digital Weighing Technology (DWT), many companies had already attempted to reduce their food waste by using a POS system. However, they were struggling to both track their waste and meet their reduction target. In this piece you will learn what are the main differences between the two methods, and why digital weighing technology is the right option to help your business reduce its food waste. What is a POS System and how is it used to reduce food waste? In a simple way, POS or Point of Sales Systems are checkout locations in business operations where transactions occur. Modern POS Systems are much more than checkout locations. They also do invoicing, analyze customer and sales data, help manage employees, track receipts, and manage inventory, among other capabilities. For restaurants, caterers, canteens and hotels, POS systems are commonly used to make the billing process more efficiently. It allows customers to pay faster even during peak time. But businesses in the foodservice industry can also use POS Systems to record the amount of food they waste relative to their food costs. The theoretical waste (variance) is the difference between the actual and the expected cost according to sales. The variance does not tell them if food waste was the reason behind the difference. In addition, the weighing tools of POS Systems are not digital. Manually weighing and recording data is time-consuming, and highly dependent on human input. It is based on estimated figures and prone to human error. This is because staff need to identify the type of waste (if it's preparation or overproduction waste, for example), record the weight, add the information to a spreadsheet and then send it to the manager. POS Systems rely on measuring the waste at the location where the system is installed. This usually happens outside the kitchen, in view of the customers by manually recording the wasted food. What is a digital weighing technology and how is it used to reduce food waste? A digital weighing technology, such as Winnow, is designed to be used by the kitchen staff, and is consisted of three components: a scale, a tablet, and the cloud software. The kitchen team uses a touch screen tablet to identify what they’re throwing away. An electronic scale records the weight and sends a message to the user, giving the cost of the food they’ve put in the bin. The meter is connected to cloud software, which records and analyses the day’s waste. This information is transformed into a detailed report which is then emailed to the chef. The report informs exactly what items were thrown away the day before, the weight, cost and when the waste occurred. 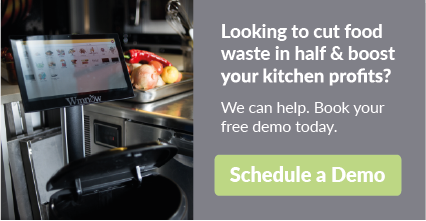 The data gives chefs the tool necessary to drive improvements in their production processes to cut food waste in half. Also, it helps chefs make better decisions, engage staff and gives them a clear focus by setting targets. The digital weighing technology has been designed specifically for busy kitchens. It is fast and simple to use. It can be self installed, not requiring companies to hire a professional engineer. The kitchen staff can easily integrate the tool into their daily work routine. Why is Digital Weighing Technology more efficient than POS System to reduce food waste? In comparison with a POS System, a Digital Weighing Technology (DWT) is less dependent on manual input decreasing the chances of human errors. Additionally, a DWT creates sophisticated analytics that generate the necessary information to help both chefs and operations make better decisions. It tells them the exact items that ended up in the bin, how much, when and where the waste occurred. What about you? Have you ever attempted to use a POS System to reduce food waste? Share your experience with us in the comments below.